Description Since the beginning battle with human, they had blocked us and it hard for us to get resources. Now the empire cheese inventory is only enough for a very short time. Without cheese, soldier morale will be hit largely and we will lose the war. So getting cheese becomes the most urgent task, do you understand? 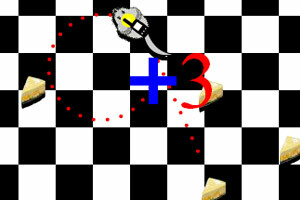 Controls Help the mouse get cheese, arrow keys to play.